On this day in history, June 26, 1784, Declaration of Independence signer Caesar Rodney dies. Rodney is best known for making his own midnight ride to vote for a declaration of independence from Great Britain on July 2, 1776. Caesar Rodney was born near Dover, Delaware, to a moderately prosperous planter who died when Caesar was only 16. On the death of his father, Caesar was placed in the home of Nicholas Ridgely, a clerk of the peace in Kent County, by the Orphan's Court. Ridgely's influence may have been the origin of Caesar's interest in politics, but he also had a grandfather who was once the Speaker of Delaware's Colonial Assembly. Starting at the age of 22, Rodney filled a number of local political positions in Kent County, including Sheriff, Register of Wills, justice of the peace, clerk of the orphan's court and recorder of deeds. At the age of 30, Rodney was elected for the first time to the Delaware Assembly, a position he served in until 1776. He also became an associate justice of the Delaware Supreme Court from 1769 through 1777. He served as a Kent County militia captain during the French and Indian War, but his unit never saw active duty. 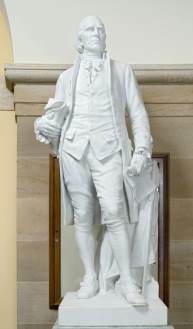 Caesar Rodney was a delegate to the 1765 Stamp Act Congress. He also served on Delaware's Committee of Correspondence. In the House of Assembly, Rodney was Speaker of the House when Delaware declared its independence on June 15, 1775. He was subsequently made a Brigadier General of the Delaware militia, charged with the defense of the state and putting down Loyalist rebellions. Rodney was elected a delegate to the Continental Congress from 1774-1776. He was a member when the vote for independence was made, but was away in Delaware when the issue was being debated. The final vote, which was scheduled for July 2, would have passed without Rodney's presence, but the other members wanted a unanimous decision from the colonies present. Delaware's other two delegates, George Read and Thomas McKean, were split in their votes. McKean sent an urgent letter to Rodney to come to Philadelphia immediately to cast his vote. He made his own "midnight ride" through the night of July 1st and arrived just as the votes were being cast on the 2nd. His vote, along with McKean's, meant Delaware voted in the affirmative for a declaration of independence. Rodney's signature was later added with the other 55 signers to the formal Declaration of Independence. Rodney was elected President of Delaware in 1778 under the new independent government. He served for three years in this position while simultaneously the general in charge of the state militia. 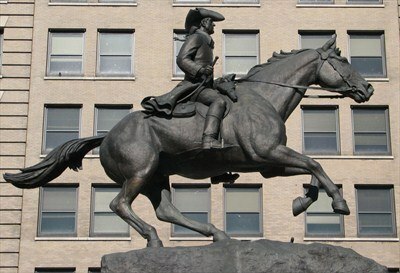 Throughout the war, Rodney was instrumental in sending supplies and troops to aid George Washington in numerous battles. In 1783, Rodney was again elected to the Continental Congress, but he did not serve because of ill health. Rodney suffered from cancer and had a cancerous growth that had disfigured his face. He was often known to wear a covering for it in public. Perhaps this was the reason that he never married. Caesar Rodney passed away at his plantation "Byfield" near Dover on June 26, 1784 at the age of 55.